I’ve always found this stanza particularly moving from a theological point of view and interesting in a poetic sense. It is an example of a triple slant rhyme, also known as half rhyme, near rhyme, or imperfect rhyme. Rude doesn’t quite rhyme with stood and neither rhymes precisely with blood. But all three are just close enough that few ever notice. Only eagle-eye (or bat-ear?) language geeks like me. Stood and blood are also examples of what is sometimes called sight rhyme or eye rhyme, where the words are spelled so nearly the same that they rhyme visually, so to speak. It’s possible that the pronunciations of these words were more similar at the time the hymn was written — I didn’t look it up. Old poetry is full of examples of this phenomenon sometimes called historical rhyme. It’s likely that love and prove were once pronounced as rhymes, since they appear often in rhyming couplets in the 17th century. I’m not sure, however, if love rhymed with prove or prove with love. 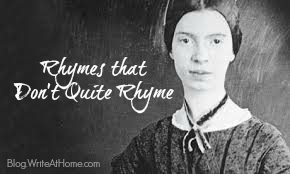 Poets and songwriters today commonly employ slant rhymes. Few of us notice (though you might start noticing now). Trust me, Emily wasn’t bad at rhyming. She’s just messing with us. Psst! Hey you! Got a comment you can spare? Leave it below. And then there was Steve Miller trying to rhyme “Texas,” “facts is” and “taxes” in “Take the Money and Run.” That would be a fair complaint against modern-day music. Thank you so much for addressing this! A young man I respected as more learned than myself – he was home educated by very well educated parents, complained about modern-day music being so ill-comprised as to not even rhyme properly. He gave some example and then called it lazy. Well, I knew I had read poetry, even Shakespeare, that seemed to have the same “problem” but I thought maybe he had some insight I didn’t. This was ten or so years ago. I have been shy from trying to write poetry of song though, because of it. I thought I needed to study poetry much more to make sure I wouldn’t be tempted into lazy-rhyming. But the examples you have are beautiful! And the “rude-stood-blood” almost seem stair-stepped – very purposeful, not lazy. I am just re-inspired by poetic expression.